At an arbitrary (selected) depth it is possible to view the distribution of skin friction as a function of displacement (settlement) of a given point of the pile. 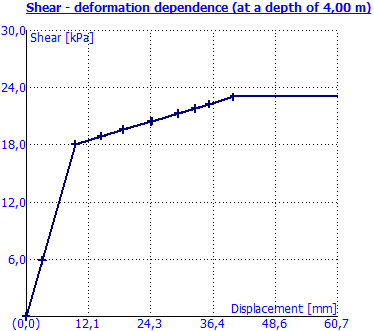 This graph shows the process of gradual reduction of shear stiffness of pile skin until zero with increasing deformation. This dependency is initially linear, particularly in stage, where the spring force does not exceed the value Tlim. When this value is exceeded the spring stiffness starts to gradually decrease manifested by the flattening of the curve.